ORCID number: Amanda Rice (0000-0003-0708-2160); Kimberley Pattrerson (0000-0003-3370-9924); Evette Reed (0000-0003-2298-6993); Belinda Wurn (0000-0002-0413-4685); Kristen Robles (0000-0002-3428-0544); Bernhard Klingenberg (0000-0001-9959-9989); Leonard B Weinstock (0000-0001-6484-1691); Janey S A Pratt (0000-0002-6850-3427); C Richard King, III (0000-0003-0807-1260); Lawrence J Wurn (0000-0002-1393-1264). Author contributions: Rice AD, Klingenberg B, King CR and Wurn LJ designed the study; Patterson K, Reed ED, Wurn BF and Wurn LJ performed the treatment; Rice AD performed subject follow up and control subject data collection; Klingenberg B performed the statistical analysis; Rice AD wrote the manuscript; Patterson K, Reed ED, Wurn BF, Robles K, Klingenberg B, Weinstock LB, Pratt JS, King CR and Wurn LJ revised the manuscript for final submission. Institutional review board statement: This study was approved by MaGil Institutional Review Board. Informed consent statement: All subjects provided consent for the study. Treated subjects provided written consent; untreated subjects provided consent via the Assessment Center online system. Conflict-of-interest statement: Belinda F Wurn and Lawrence J Wurn are the owners of Clear Passage. All other authors report no conflicts. Data sharing statement: Data will be available upon request deidentified with IRB approval. To compare (1) quality of life and (2) rate of recurrent small bowel obstructions (SBO) for patients treated with novel manual physiotherapy vs no treatment. One hundred and three subjects (age 19-89) with a history of recurrent adhesive SBO were treated with a manual physiotherapy called the Clear Passage Approach (CPA) which focused on decreasing adhesive crosslinking in abdominopelvic viscera. Pre- and post-therapy data measured recurring obstructions and quality of life, using a validated test sent 90 d after therapy. Results were compared to 136 untreated control subjects who underwent the same measurements for subjects who did not receive any therapy, which is the normal course for patients with recurring SBO. Comparison of the groups allowed us to assess changes when the physiotherapy was added as an adjunct treatment for patients with recurring SBO. Despite histories of more prior hospitalizations, obstructions, surgeries, and years impacted by bowel issues, the 103 CPA-treated subjects reported a significantly lower rate of repeat SBO than 136 untreated controls (total obstructions P = 0.0003; partial obstructions P = 0.0076). Subjects treated with the therapy demonstrated significant improvements in five of six total domains in the validated Small Bowel Obstruction Questionnaire (SBO-Q). Domains of diet, pain, gastrointestinal symptoms, quality of life (QOL) and pain severity when compared to post CPA treatment were significantly improved (P < 0.0001). The medication domain was not changed in the CPA treated group (P = 0.176). CPA physical therapy was effective for patients with adhesive SBO with significantly lower recurrence rate, improvement in reported symptoms and overall quality of life of subjects. Core tip: A manual soft tissue physical therapy protocol is an effective low risk preventative treatment option for patients who suffer recurrent adhesive small bowel obstructions. It increased the quality of life of subjects by decreasing pain, decreasing recurrent obstructions, improving diet and increasing bodily function. Because the therapy was performed in an outpatient setting, it eliminated the need for hospitalization and the risk and increased cost of surgery. Adhesive small bowel obstruction (SBO) is a common life-threatening complication of surgery or abdominal trauma in both pediatric and adult populations, typically caused by adhesions that form as a normal part of the healing process[1-3]. As a side effect of the inflammatory response required for healing to occur, adhesions form in tissues at and near the surgical repair within hours, due to the presence of collagen and scar tissue mediators. Surgery is frequently cited as the primary cause of adhesive bowel obstruction; repeat surgery increases the risk of adhesion formation. The financial cost per patient for adhesiolysis and bowel resection was $65955 and $114175, respectively, with 30-d hospital readmission rates of 12.3% and 18.1% in the United States in 2010. The average hospital stay for cases of SBO surgery was 14.2 d, and for abdominal adhesiolysis was 8.4 d.
The present cost of a one-week course of CPA physical therapy is under $7000 in the United States (and is comparable in the United Kingdom). The therapy is performed in an outpatient setting; no hospitalization or surgery is required. A large previously published clinical study that followed adult subjects 10 years post-surgery found that more than 30% of the surgical small bowel resection subjects underwent additional surgery due to adhesions within the study time frame. In a prospective analysis of patients undergoing laparotomy who had previously had one or more abdominal operations, 93% (195/210) were found to have adhesions attributable to their prior surgery. Patients with mesh inserted during surgery have been identified as having an increase in adhesion formation, leading to increased complexity of future surgical procedures[7-9]. Thus, adhesion related disease causes significant surgical efforts, hospital resources and comprises major expenditures each year. Additionally, there is a considerable negative impact on the patients’ quality of life (QOL). In the absence of bowel ischemia, strangulation or perforation, current guidelines for the management of SBO are gastric decompression with suction, full strength gastrographin (in some institutions), and IV hydration for the first 24-72 h to see if the obstruction will resolve without surgery. While sometimes effective in treating the current obstruction, this approach does not address the internal adhesions or the risk of subsequent bowel obstructions[11,12]. The only treatment currently available to reverse adhesive bowel obstructions is surgery, which frequently causes new adhesions. A number of surgical techniques, modifications, and adhesion preventing medications and barriers have been investigated, but no solution has been shown to significantly prevent the formation of adhesions to date[13-19]. Thus, any therapy that decreases the risk of bowel obstruction in the absence of surgery is of significant importance. Manual physical therapy (mPT), a method of physiotherapy and rehabilitation, is used to treat patients with a wide variety of adhesive conditions including burns, adhesive capsulitis, radiculopathy, pain, infertility, and lessening of scars[20-30]. This therapy has shown promise in preventing adhesion formation in animal models[31,32]. The Clear Passage Approach (CPA), a specialized mPT regimen, hypothesized to deform the adhesions that cause SBO episodes, has been demonstrated as effective in decreasing adhesions, pain, and improving QOL in subjects with recurrent SBO in case control and efficacy studies[33-35]. In pilot studies, independent radiologic reports showed that the therapy cleared bowel stricture and obstruction, obviating the need for planned laparotomy for adhesiolysis and SBO[36,33-35]. Surgery is often necessary in cases of bowel obstruction complicated by ischemia or caused by hernia or cancer, however surgery has not been shown to improve quality of life (QOL), reduce pain or recurrence rate in patients with adhesive SBO. Further, except as shown in pilot studies of CPA therapy, there is currently no other treatment available to patients with known adhesions who are currently not obstructed to reduce recurrence, pain or need for further surgery. In this study, we report on the use of the CPA, a manual physical therapy protocol, to treat abdominal and pelvic adhesions that cause SBO, and to improve the quality of life (QOL) of study subjects when compared to untreated subjects in a control arm. The aim of the study is twofold: (1) To determine whether a manual physiotherapy can lower the rate of repeat SBO in patients who have undergone prior adhesive bowel obstructions and surgeries, and (2) to examine whether the therapy can improve the quality of life of these patients, using a validated test. The hypothesis is that the manual physiotherapy treatment can decrease SBO recurrence and improve the self-reported quality of life in subjects with a history of adhesive SBO, compared to untreated control subjects. Subjects in the retrospective CPA treatment arm were selected for inclusion in the study based upon medical history and completion of both a pre-treatment and post-treatment questionnaire. Only adult subjects were included in this study. Exclusion criteria included: BMI > 36, active infection, abnormal ovarian cysts, surgery within the last 90 d, and bleeding disorders. Each subject was provided with a written informed consent as is standard for the clinical practice. Subjects with a recent history of cancer were excluded from this study. A total of 103 subjects were treated at one of five private physical therapy clinics affiliated with Clear Passage between November 2012 and October 2015. All CPA therapists and affiliates completed 80 h practical training and evaluation course prior to becoming certified in the Clear Passage Approach. All subjects with follow up were eligible and included in the analysis. Subjects in the control arm were recruited via website and online advertisements for the study. Inclusion criteria included: adult subjects who had experienced a partial or total bowel obstruction within the last two years. Exclusion criteria included: Cancer within the last 5 years, chemotherapy or radiation treatments in the last 10 years, current pregnancy, or prior treatment at Clear Passage. All study related activities were performed via the NIH Assessment Center (http://www.assessmentcenter.net ) including screening, informed consent and all data collection. A total of 460 subjects were screened, with 281 subjects eligible and 260 completing the initial questionnaire; 6 subjects were removed from the control study due to having previously received CPA treatment, 117 subjects were lost to follow up, 1 subject was removed due to less than 50% of the follow up questionnaire being completed. A total of 136 subjects completed both questionnaires and were included in the analysis. The study diagram is shown in Figure 1. This study was approved by MaGil Institutional Review Board. This was a non-randomized controlled study comparing subjects with a history of SBO that underwent CPA treatment to that of untreated control subjects. The CPA treatment group included a retrospective chart review of subjects treated for adhesive disease with a history of SBO that had undergone standard clinic follow up. All subjects included in the treatment arm received treatment within private outpatient physical therapy clinics by therapists certified in the CPA. Subjects in a prospective untreated control arm, including those not treated with the CPA, were recruited for participation in a survey based observational data collection. Outcomes were measured via an observational manner using the validated paper based SBO Questionnaire (SBO-Q) using previously established quartiles. The SBO-Q was developed and validated to be used as a patient reported tool to quantify the experiences of patients with recurrent SBOs. The questionnaire is comprised of five domains and a pain rating section. Each domain measures a distinct aspect of QOL. The Diet domain assesses the diet of the subject from inability to tolerate any liquid to a normal solid food diet. The Pain domain reported pain throughout the body, with oral intake of food or liquid, and with bowel function. The Gastrointestinal (GI) Symptom domain quantifies symptoms often associated with SBO such as nausea, emesis, bowel spasm and constipation. The Medication domain reports the frequency of medications required to maintain bowel function. The QOL domain quantifies the amount of time off work, social activities and overall concern of the patient regarding their bowel function. These tend to be major lifetime concerns for many people who experience recurring bowel obstructions. Subjects provided previous medical history and records; no radiologic evaluations were performed as a part of the study. Questionnaires were completed prior to treatment for the control measure. The post-treatment questionnaires were sent to the subjects 90 d post-treatment, with completion at 78-140 d post-treatment for the CPA treatment arm and 90-115 d for the control arm subjects. For evaluating the power of our study, we made some simplifying assumptions. We assumed that differences in the 6 domain scores before and after treatment follow a normal distribution. For all but two of the SBO-Q domains we assumed that the mean difference was zero (i.e., no treatment effect), but for two domains we assumed that the treatment lowered the average domain score by 1 point. We assumed that the standard deviation of each difference was 2.5 points. We then simulated the power by looking at the proportion of times that both multiplicities adjusted two-sided P-values for the two domains where we assumed a treatment effect is less than 5%. When selecting a sample size of 100, this was the case in 82% of our simulations. Therefore, 100 patients in the pre- and post-treatment comparison result in at least 80% power to detect a significant difference of 1 point in the mean domain score of two domains. All computations were made in the statistical software R.
Subjects treated with the CPA received manual therapy to areas of the body identified by the treating therapists as showing decreased mobility or function during the evaluation via palpation and range of motion tests. All subjects were evaluated from head to toe. In the case of these subjects the focus of the therapy was to the abdominopelvic viscera that demonstrated decreased mobility, hypothesized to be due to adhesions formed after surgery, trauma, or other tissue damage, therefore leading to SBO episodes. The majority of the therapy focused on treating abdominopelvic viscera that demonstrated decreased mobility with palpation. Treatment was administered in multiple hour sessions, which included up to four hours a day over the course of 5 d with the typical subject completing 20 h of treatment. The average number of treatment hours per subject was 22.6 ± 8.5 h with a range of 10-74 h; 75 of 103 subjects in CPA treatment group received 20 h of treatment. In order to decrease adhesions, the CPA uses techniques from a variety of manual modalities to treat the subject in an individualized manner, focusing on each subjects’ areas of restriction and concern with the goal of deforming adhesions and increasing the mobility of adhered tissues and organs, working from the most superficial tissues to those deeper in the body. The therapy accomplishes this by the use of various site-specific pressures across restrictive bands of adhered tissues and structures within the abdomen and pelvis, using a bimanual deep massage. The intent of the therapy is to detach and reverse the crosslinking that binds collagenous fibers together to form adhesions. The therapists work progressively deeper from the most superficial tissues restoring mobility via myofascial release. Adhesions within and between organs and interstitial spaces within the viscera were addressed using the Wurn technique[29,34] which is a bimanual soft tissue manipulation that can include a slow stretch to adhered areas within the abdomen and pelvis, previously shown to return patency to occluded fallopian tubes. The intent of this technique is to detach crosslinks that bind collagen fibers, thus shearing apart adhesions manually, in order to return the tissues to a more mobile, less adhered state. Toward the end of deep tissue work, CPA certified therapists may use visceral manipulation to increase organ motility. The amount of force and time the force was applied to each area has the potential to be significant but was maintained within the tolerance of the subject in accordance with guidelines of the American Physical Therapy Association. Detailed clinical treatment records were maintained throughout the course of therapy. Subjects enrolled in the control arm of the study were not monitored as this was an observational web-based study arm. Subjects included in the treatment arm were monitored daily for changes in pain, diet, bowel habits and overall well-being during their treatment as is standard practice. Adverse events were monitored by the treating therapists during the course of treatment and reviewed during the chart review process. There were no adverse events reported in the CPA treated group within the clinical data, or by follow up. The overall degree of adhesive disease was determined using a clinic generated disease scoring table that takes into account all qualitative and quantitative measures performed during the initial evaluation and post treatment discharge assessment. The degree of impact on a subject’s quality of life for range of motion was determined using multiple resources, as well as the extensive experience of the therapists. Multiple other standard physiotherapy tests were also performed and included in the assessment for disease score[40-44]. Supplemental Table 1 contains the disease scoring protocol in which the score is expressed as a decimal in which 0 represents no disease or impact on overall function and 1 is severely impacted. We used χ2 tests and t-tests for the analysis comparing the demographic and medical variables between the treated and control group. For analyzing the multivariate responses from the SBO-Q we used the minimum P-value based on a paired t-statistic for each survey question as the test statistic for the overall and the domain hypotheses. The raw and multiplicity adjusted P-values displayed in tables refer to testing the null hypothesis that the mean difference between the initial and follow-up survey equals 0. Since there are 6 domains for which we tested for a mean difference, we used multiplicity adjusted P-values to adjust the raw P-values and account for the fact that we are testing 6 hypotheses simultaneously. For a particular domain, a significant difference in the mean domain score can be concluded when the corresponding multiplicity adjusted domain P-value is less than 0.05. Using the multiplicity adjusted P-values (computed via the Bonferroni correction) will control the overall (familywise) error rate at 5%. Similarly, the multiplicity adjusted P-values for each survey question account for the fact that we are testing 37 hypotheses comparing mean differences simultaneously, one for each question. For any given survey question, a multiplicity adjusted P-value less than 0.05 implies a significant difference in the mean score, controlling the overall rate of Type I errors at 5% when testing these 37 hypotheses simultaneously. The statistical package R (R Foundation for Statistical Computing, Vienna, Austria) was used for all statistical analyses. A total of 103 CPA treated subjects and 136 untreated control subjects were included in the analysis. Demographics for study subjects are located in Table 1 and number of prior surgeries and bowel obstructions are located in Table 2. Subjects in the CPA treatment group were significantly older, and the total numbers of prior surgeries, partial SBOs, and years impacted with bowel symptoms were much higher than that of the control group. There were 46.2% male subjects in the control group and 32% male subjects in the CPA treated group (P = 0.0853). The average age of subjects in the control group was 36.4 ± 12.5 years and 54.5 ± 15.7 years for the CPA treated group (P < 0.001); the average number of prior surgeries in the control is 2.07 ± 1.29 as compared to 4.56 ± 2.86 for the CPA treated (P = 0.0001). The average number of prior partial SBOs in the control group was 1.88 ± 1.60 and 3.97 ± 5.09 in the CPA treated group (P = 0.0001). The number of total SBO was 2.17 ± 1.85 for the control group and 1.68 ± 7.95 for the CPA treated group (P = 0.4894). The number of years the subjects reported bowel symptoms impacted their lives was 5.5 ± 7.2 for the control group and 10.7 ± 11.2 for the CPA treated group (P < 0.001). All subjects at the 90-d follow up questionnaire were queried regarding the numbers of bowel obstructions, hospitalization, and surgery for SBO experienced. There were differences between the groups, with the CPA treated group reporting fewer total number of obstructions, hospitalizations and surgeries. A total of 124 control and 103 CPA treated subjects responded to the questions. 21.77% of the control group subjects and 8.74% of the CPA group subjects experienced a partial bowel obstruction between the two questionnaires (P = 0.0076), 14.52% of control group subjects and 0.97% of CPA group subjects reported a total bowel obstruction (P = 0.0003), 5.65% of control group subjects and 1.94% of CPA group subjects reported undergoing surgery for a bowel obstruction (P = 0.1548). The differences between untreated and treated patients at follow up would naturally extrapolate into a sizable decrease in cost, due to avoiding repeat SBO-related hospitalizations and surgeries. For both the control and CPA group we tested the null hypothesis that for each of the 6 domains the mean domain score the first time the survey was administered was equal to the mean domain score the second time the survey was administered 90 d later. The alternative hypothesis was that there was a significant difference in the mean domain score between the initial and follow-up administration of the survey for at least one domain. Missing data from any question/subject was removed from the overall analysis. For the control group data, despite the fact that no intervention took place between the two times the survey was administered, Table 3 shows a significant difference (multiplicity adjusted P < 0.05) in mean domain scores for the Pain and GI Symptoms domain. However, the lower bounds of a corresponding confidence interval for the mean difference in domain scores are close to zero (0.02 and 0.05, respectively), indicating that, while statistically significant, the actual improvement may be very small. Table 3 Average difference (before/after) in Small Bowel Obstruction Questionnaire scores and P-values for each domain and question for the control group. 1Denotes domains for which average scores (over all questions within a domain) are significantly different between the initial and the follow-up survey, controlling the familywise error rate (over the 6 domains) at 5%. 2Denotes questions for which scores are significantly different between the initial and the follow-up survey, controlling the familywise error rate (over the 37 questions included in the SBO-Q) at 5%. SBO-Q: Small Bowel Obstruction Questionnaire. A further analysis of the individual survey questions shows that within the Pain domain, General, Lower GI, BM and Eating pain improved significantly between the initial and follow-up survey. However, note the small lower bounds for the corresponding confidence intervals for the mean difference, indicating very small changes except perhaps for BM and General pain. The significant improvement in those two could reflect a time-effect, the perceived pain lessening over time. Similarly, the three significant differences for individual questions in the GI Symptoms domains all have very small lower bounds of corresponding confidence intervals. For all other domains and all other individual survey questions within domains no significant differences emerged (multiplicity adjusted P-values > 0.05). The diet domain had multiplicity adjusted P = 0.425, the Medication domain P = 0.804, and the QOL domain P = 0.126, all indicating no major changes in symptoms over the three-month period studied. Table 4 Average difference (before/after) in Small Bowel Obstruction Questionnaire scores and P-values for each domain and question for the Clear Passage Approach treatment group. 2Denotes questions for which scores are significantly different between the initial and the follow-up survey, controlling the familywise error rate (over the 37 questions) at 5%. Overall, in the CPA group 29 out of 37 survey questions showed a significant difference (in fact, improvement), compared to just 7 in the control group. Judging by the confidence intervals (CIs), some of the strongest improvements were seen in the Pain, QOL, and Diet domains. In the Pain Domain, notable improvements occurred for the questions “Experience of pain in general” (CI: 0.43-1.34), “Experience pain in the upper GI region” (CI: 0.41-1.29), “Recent Maximum Pain” (CI: 1.62-3.78) and “Duration of Pain” (CI: 0.61-1.82). Patients who have undergone the significant trauma of SBO accompanied by long hospital stays (average 14.2 d), followed by invasive surgeries and recovery from those events have significant “QOL” concerns afterwards. With regard to the QOL domain, some noteworthy large differences between the initial and follow-up survey were observed for the question “How often the subject worries about another SBO” (CI: 0.78-1.85), “How often the subject was unable to perform daily functions” (CI: 0.53-1.45) and “How often the subject was unable to attend social events”, (CI: 0.36-1.21). Related to QOL but analyzed under the Diet domain, the question about “The ability to eat anything” also showed some large improvements (CI: 0.44-1.53). When the total number of subjects per SBO-Q domain are assessed for both questionnaires for the quartiles indicating the degree of impact (normal, mild, moderate and severe) it was observed that the general trend demonstrated more subjects reporting experiences corresponding to no impact or normal for the quartiles in the CPA treatment group than the control group (Table 5). 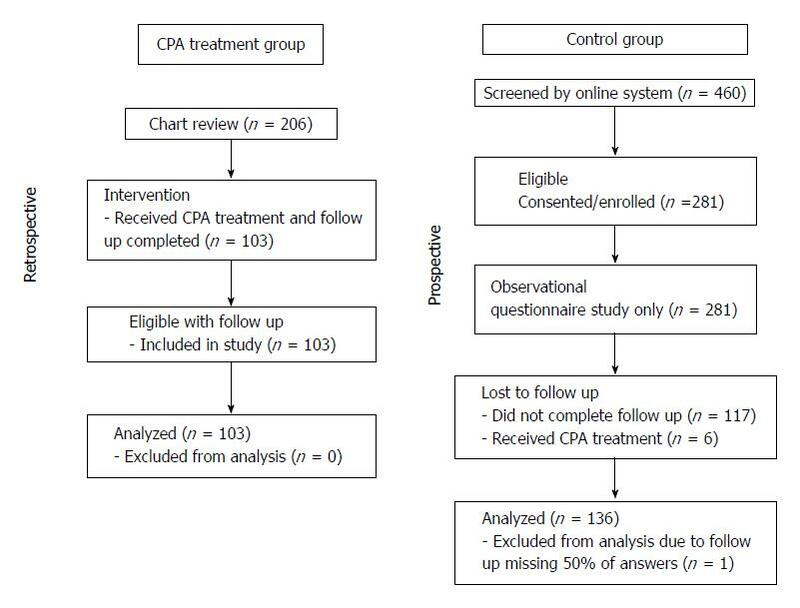 The significance observed in the individual question score analysis is also observed in this representation of the data, showing the clinical significance of these changes in the CPA treated group. Table 5 Quartile assignment for each domain of the Small Bowel Obstruction Questionnaire for all groups and questionnaire time points. All CPA treated subjects underwent a comprehensive physical therapy initial evaluation that included measurements for range of motion (ROM). It has been previously demonstrated that a significant improvement in ROM in the trunk was observed in patients with a history of SBO and may be a positive predictor for outcome. Included in these measurements are: trunk flexion; trunk extension; left and right side bending; left and right trunk rotation[40,42-44]. Every subject who presented with decreased ROM demonstrated improvement for at least one of the measurements presented in Table 6. Furthermore, 31.47% of total measurements were within the normal range after CPA treatment compared to 19.74% before treatment. Although not all subjects had a normal ROM for all measures after treatment, all subjects demonstrated overall improvements. Table 6 Range of motion averages in Clear Passage Approach treated subjects prior to and post Clear Passage Approach treatment. Statistical analysis of changes showed a significant increase in the mean ROM after treatment compared to before for all six measures (multiplicity adjusted P-values < 0.05). Patients with a history of SBO and surgery often presented with a kyphotic posture; we surmised this was due to the pull of abdominal adhesions, creating a forward flexion of the trunk. The improvement in trunk extension following CPA treatment suggests that adhesions in the abdomen and pelvis that prevented the subject from bending backwards or standing upright prior to therapy diminished enough to show significant improvement in trunk extension following the manual treatment. The improvements in side bending and rotation also suggest that decreasing adhesions in the abdomen and pelvis allowed improved trunk ROM. These findings indicate that improvements in trunk ROM measurements may be suitable as a predictor for degree of adhesion deformation post CPA treatment. The observations made by the therapists at the initial evaluation and after CPA treatment were utilized to generate an objective numerical value for analysis of the overall state of the adhesive disease of the treated subjects. This numerical score takes into account the entire patient - assessed from head to toe, and includes ROM, organ motility, standard physical therapy tests, posture and tissue response with a range from 0 (no disease or deficiencies) to 1.0 (maximum disease) (supplemental Table 1). A total of 101 subjects in the CPA treated group were included in the assessment; results showed significant improvement in the full body disease score. Prior to CPA treatment the average disease score was 0.65 ± 0.11 (range 0.37-0.95) compared to post CPA treatment 0.29 ± 0.10 (range 0.1-0.53) (P < 0.001). This measure correlates well with both the ROM measures (Table 6 and the changes observed in the quartiles post CPA treatment in Table 5). It is widely accepted that the adhesions that cause SBO and symptomology in subjects are often caused due to prior abdominal or pelvic surgery[10,46]. This study is the first controlled study of a specific physical therapy protocol known as the Clear Passage Approach (CPA) in subjects with a history of SBO. The results of this study are very similar to those reported in an earlier uncontrolled efficacy study and case reports using the CPA to treat subjects with recurring SBO. In all measures, the subjects treated with the CPA experienced significant improvements as compared to experiences before CPA treatment and when compared to untreated controls. Manual physical therapy can provide adjunct therapy for known adhesions where there is no other available therapy proven to decrease recurrent SBO or to treat pain associated with adhesive disease. Unlike surgical procedures, adhesions do not appear to occur after treatment with the CPA. Because treatment group participants had more complex histories and symptoms, their improvements likely had more of an impact on daily function than subjects in the control group. The results from this study suggest that the CPA can be used to treat adhesions and scar adherence safely in the recurrent SBO subject population, demonstrating significant improvements in overall pain, severity of pain, QOL and number of episodes of SBO as compared to untreated subjects. Further, subjects who were previously concerned about having another SBO episode reported a significant decrease in that concern three months after treatment. In addition, the cost savings from using a relatively inexpensive outpatient treatment in place of surgery to prevent future obstruction, hospitalization and surgery is worthy of consideration. Based upon changes in range of motion and disease scores, it is inferred that tissue and organ mobility was improved as the subjects demonstrated an increased range of motion in active movement tests. Improvements in range of motion allowed subjects to perform daily tasks more easily and contributed positively to their overall QOL. The limitations of this study include the lack of randomization and sham treatment group. A sham treatment is challenging to accomplish in a study such as this where the treatment is 20 h of manual therapy over the course of one week. Indirect measures used to assess adhesions in the subjects including improvement in self-reported symptoms; ROM and objective disease scoring were used as outcome measures. While these measures are indirect, all correlated well with the post CPA treatment experiences and the decreased number of SBOs and surgeries in the treatment group, compared to the control group. Today when a patient is discharged after non-surgical (or surgical) management of adhesive SBO, there is no therapy that can be prescribed to help reduce recurrence. Further, the quality of life for patients who have undergone SBO, with or without surgery, is often greatly compromised. Repeat surgery for SBO is widely regarded as a primary cause of recurring SBO. This technique appears to delay or obviate surgery for many patients who have undergone the trauma of SBO, at a fraction of the cost of surgery. It offers a therapy where none is currently available. The CPA therapy appears to be a viable conservative option for patients who previously were told that there was nothing that they could do to reduce their chances of recurrent SBO. Manual physiotherapy (mPT), called “manual physical therapy” in the United States, has been used to treat a wide variety of adhesive conditions including burns, adhesive capsulitis, radiculopathy, pain and the lessening of scars. In pilot studies, independent radiologic reports showed that the Clear Passage Approach (CPA), a specialized mPT performed in an outpatient setting, cleared bowel stricture and obstruction, obviating the need for planned surgical adhesiolysis and bowel resection. In case control and efficacy studies, CPA demonstrated effectiveness decreasing adhesions and pain, and improving quality of life (QOL) in subjects with recurrent small bowel obstruction (SBO). Surgery is often cited as a primary cause of recurrent SBO due to the formation of post-operative adhesions. If a non-invasive outpatient therapy can decrease recurrent SBO and reduce the need for additional surgeries, it can improve quality of life for patients, with lower risk and decreased cost. Adhesions that form after surgery present major problems for physicians and their patients. Surgeons note that adhesion barriers and gels are not always effective at preventing recurrent adhesions. The opportunity to delay or prevent post-surgical adhesions that can cause pain and recurring bowel obstruction is profound for patients. Many people live in fear that another major surgery or death could occur at any time, due to a recurrent obstruction. The study has two main objectives: (1) To determine whether a manual physiotherapy can lower the rate of repeat SBO in patients who have undergone prior adhesive bowel obstructions and surgeries; and (2) to examine whether the therapy can improve the quality of life of these patients, using a validated test. This is a controlled phase two study in which 103 subjects with a history of recurrent adhesive SBO were treated with a manual physical therapy called the CPA. The focus of the therapy was to decrease adhesive crosslinking in abdominopelvic viscera. Pre- and post-therapy data measured recurring obstructions and quality of life using a validated test sent 90 d after therapy. Results were compared to 136 untreated control subjects who underwent the same measurements, but who did not receive any therapy. Until this method was developed, physical therapy has never been investigated as a course to treat recurring SBO. Despite histories of more prior hospitalizations, obstructions, surgeries, and years impacted by bowel issues, the 103 CPA-treated subjects reported a significantly lower rate of repeat SBO than 136 untreated controls (total obstructions P = 0.0003; partial obstructions P = 0.0076). Subjects treated with the therapy demonstrated significant improvements in five of six total domains in the validated Small Bowel Obstruction Questionnaire (SBO-Q). Domains of diet, pain, gastrointestinal (GI) symptoms, quality of life (QOL) and pain severity when compared to post CPA treatment were significantly improved (P < 0.0001). The medication domain was not changed in the CPA treated group (P = 0.176). Numerous studies examine the use of mPT to decrease adhesions and pain, and to improve function for conditions in various parts of the body. Pilot studies that examine the use of CPA include independent radiographs of cleared bowel obstruction. In a 10-year retrospective study of using CPA to treat adhesion-related female infertility (n = 1392), CPA opened blocked fallopian tubes in 60.85% (143/235) of women diagnosed with total tubal occlusion. In a recent study, mPT was shown to disrupt bowel adhesions in a rat model. This is the first controlled study of using a manual physiotherapy to decrease adhesions in the bowel. The availability of the therapy is presently limited to private outpatient clinics in the United States and United Kingdom where therapists have been fully trained and certified in the CPA. A manual physiotherapy significantly improved quality of life and significantly decreased the rate of re-occlusion for patients with a history of SBO. Performed in an outpatient setting, the non-invasive therapy significantly reduced repeat obstructions. In addition, the physical therapy has a much lower risk and cost than hospitalization or surgery. The study proposes that manual physiotherapy, which is commonly used to decrease adhesions in a variety of conditions, may be useful to decrease adhesions in the bowel. As such, it may delay or prevent recurring SBO. A manual physiotherapy significantly decreased the rate of recurrent small bowel obstruction (SBO) and improved quality of life for patients with a history of prior SBO. Based on the decreased number of recurring obstructions and the measurable improvements in trunk range of motion, this manual physiotherapy can significantly improve outcomes and quality of life for patients who undergo abdominal or pelvic surgery to treat adhesions or SBO. This study proposes the use of a specialized manual physiotherapy, the CPA, to delay or prevent recurring SBO. This study confirmed and quantified hypotheses from earlier pilot studies that CPA could increase QOL, delay or prevent recurring SBO, and delay or obviate the need for additional surgery for patients with recurring SBO, with less risk and a lower cost than the present model. The major implication for clinical practice is that physicians, who are often stymied by the frequent recurrence of adhesions and SBO following abdominal surgery or resection, now have a less risky and less costly alternative to repeat surgery. There is a place for a multi-disciplinary approach to a vexing problem for surgeons - the recurrence of adhesions and SBO following abdominal surgery or pelvic surgery. We hope to be able to quantify further the degree to which CPA can decrease the recurrence of SBO, and the need for repeat surgeries. A prospective controlled study with closely matched study groups could be performed with the CPA method vs sham physiotherapy. CONSORT 2010 statement: The guidelines of the CONSORT 2010 Statement have been adopted for this study.